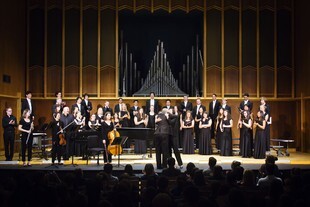 Six weeks into the 2014 academic year, the Conservatory teamed together with the Christian Fellowship of Art Music Composers (CFAMC), Biola’s Center for Christianity, Culture and the Arts (CCCA), and the Torrey Honors Institute to host a grand festival of new music. Over 65 composers from all over the United States and Canada converged, together with Orthodox priest and celebrated European composer Father Ivan Moody, to share in 12 concerts made up almost exclusively of their own original works. All of these pieces were written within the past 30 years, and several even received their world premieres at this event. Other featured guest artists and ensembles included the award-winning Cadillac Moon Ensemble, pianists Paul Barnes and Solungga Fang-Tzu Liu, baritones Richard Zeller and Joel Balzun, Ensemble Christo LA, and the Paul Delgado Singers. CFAMC was founded in 1994 by Mark Hijleh to provide a place for Christian composers to come together and share their thoughts and perspectives on what it means to be a follower of Christ who is concerned with the advancement of “art music,” as opposed to popular music or music expressly written for church functions. Composers sharing their music is a vital part of this interaction that is best achieved by means of live performances at annual conferences such as the one held here at Biola. The schedule for the conference was carefully planned in order to accommodate as many activities as possible while participants were in town and able to take part. The first day of the A Weekend of Wonder conference featured, among other excellent works, an hour-long composition by Fresno Pacific University’s Walter Saul. Saul was inspired by a vivid array of quilts that he displayed in sequence on a large overhead screen during the performance. After a mixed media presentation by collaborative artists Steve and Jeffrey Roden, virtuoso pianist Paul Barnes concluded the evening with an electrifying solo concert including works by Phillip Glass, Joan Tower and Victoria Bond. Barnes featured CFAMC composers as well, including Biola alumnus Lucas Floyd and current student Jonah Gallagher, whom Mr. Barnes referred to as “the youngest composer I have ever performed with.” Gallagher is currently working toward a Bachelor of Music in Composition at Biola. Friday’s schedule included no less than five separate concerts. The day’s highlights included a complete performance of Tegel Passion, an oratorio based on the life of Friedrich Bonhoeffer for tenor soloist, choir and orchestra by Lincoln Hanks of Pepperdine University. The exclamation point for the conference came with its final concert, where the Cadillac Moon Ensemble, a New York-based group of new music specialists, performed a concert entirely comprised of CFAMC premieres. Local clarinetist Eric Henry Jacobs joined the ensemble for the last piece on the program, a stunning work by Wheaton Conservatory’s Shawn Okpebholo. Composition area coordinator and professor Dr. Robert Denham said that hosting the conference alongside CCCA was one of the most significant endeavors of his life.